In 1956 the French postal authority of the New Hebrides issued a set of 4 stamps celebrating the 50th anniversary of the establishment of the Condominium. A similar set of stamps was issued by the British postal authority. 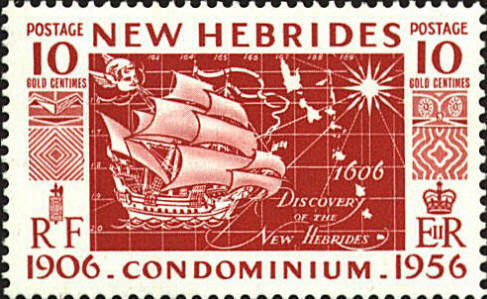 Two of the stamps picture a sailing ship and a map of the islands with the date 1606 and the motto, Decouverte Nouvelles Hebrides, "Discovery of the New Hebrides." On December 21, 1605 Pedro Fernández de Quirós (1565-1614) sailed from Callão, Peru with three ships, San Pedro y Paulo, San Pedro, and Los Tres Reyes. In May 1606 the expedition reached the islands later called the New Hebrides. Quirós landed on a large island which he took to be part of the sourthern continent, and named it La Austrialia del Sepiritu Santo, "the Southern Land of the Holy Spirit." Europeans did not return until 1768, when Louis Antoine de Bougainville rediscovered the islands. In 1774, Captain James Cook named the islands the New Hebrides, a name that lasted until independence. In 1906 France and the United Kingdom agreed to administer the islands jointly as a Condominium. In 1980 the Republic of Vanuatu was created.